How do you create a recipe? This app doesn’t allow you to generate or create a new recipe. About four years (about 4 brews a year) of recipes lost. The recipe shells are still there even, taunting me. 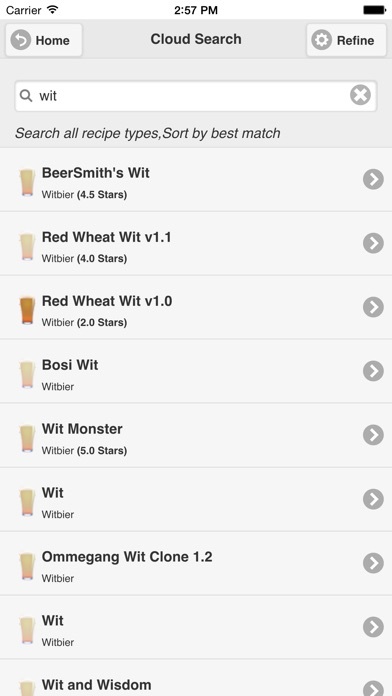 But BeerSmith apparently updated at some point and removed all the ingredients I spent so much time tweaking after brews. Now I’m just sad. It's a great tool for brew day...that's probably about it in its current state. I had a folder filled with recipes that just vanished. All I did was hit the back button to go to the previous folder and it disappeared. Probably about 10-15 recipes just vanished. So I Madea new folder and started adding to it...same thing happened. Until this is fixed I'll be using Brewers Friend. So disappointing. 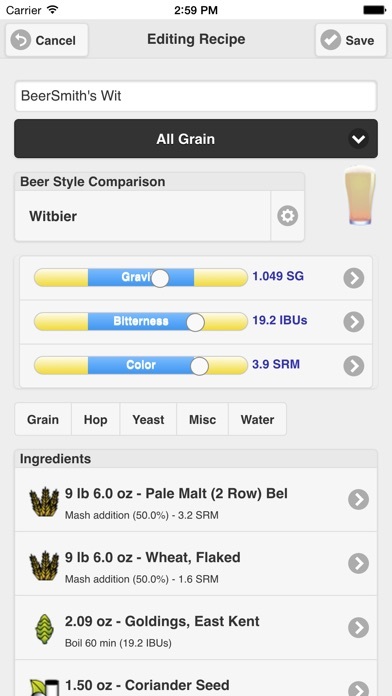 Overall it’s a pretty handy app to compliment Beersmiths3 desktop app. After reading the help section I found out how to transfer equipment profiles in special ingredients to the app. The one thing I would love for them to add is inventory, and shopping list cloud integration. That would be fantastic for when one goes to the brew shop. Nice when it works, but pretty frustrated lost everything. Update: this is still an issue. Lost all recipes and brewing data again as of 10/15/18. So So Disappointed - It has major problems! 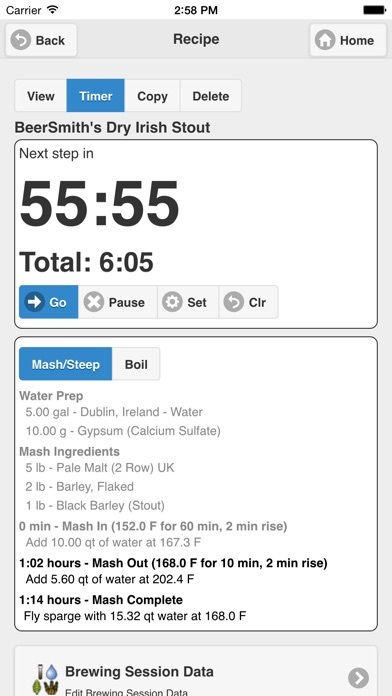 First let me say I was stoked to find this app to managed my brews from a tablet. 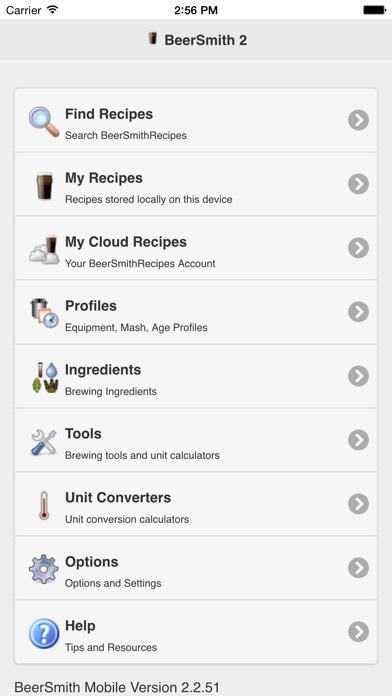 I've seen Brewsmith referenced in numerous forums and had great expectations. So how disappointed was I when I paid my money and download it, VERY. First, the general design and layout is not very intuitive. The human factors aspect is rather poor, and with very little work it could be greatly improved. I feel not much effort was made in its design. It really needs a complete rethink. Setting this aside, the biggest bugaboo is with the water analysis feature. It is borderline useless, and in fact so bad I was forced to use a different program, defeating the object of getting this app. Let me explain. Water is treated as an ingredient, which makes sense. You can define your water profile. There is also a water analysis tool, great you say, not so fast. First it disconnected from your recipe, so it does not pick up on the amount of water needing to be adjusted. Moreover, there is no way to select a target water profile to adjust your actual brewing water against. There is a drop down list of many water profiles, but if you select one it assumes that this is the water you are using in the recipe. There is no way to select a target water profile, and make an adjustment against the actual water you are brewing with. Yes really! As I said this tool is useless. There are so many good water analysis tools to use as a design reference. There are even tools that automatically work out the mineral adjustments, nirvana, but I would settle for the absolute barebones functionally of manual adjustment. There is another major problem with the app. First if you like to BIAB you will find now way under the equipment section to account for wort absorption. Moreover, if you keep the grain quantity the same and increase the final wort volume in an attempt to account for absorption the pre-boil SG remains unchanged. I'm of the opinion that this entire section is broken. I would hold off getting this app, it's not worth the frustration as you will find yourself using a different program. 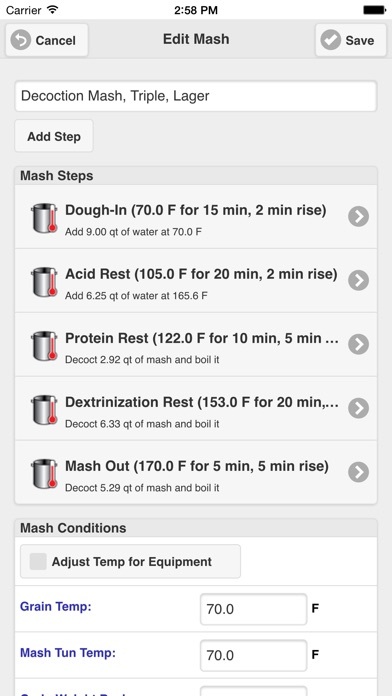 I’ve enjoyed using this app for recipe development and actual brew days. However, with the newest update came a few bugs. I am no longer able to view or select a yeast when creating/editing a recipe. Even under “ingredients,” I am unable to see the various options for yeast. A window pops up saying there is a “java script error...” I would rate this app higher, but this error is a “thorn in my side” at the moment. When I try to add any fermentable I get a indexfull.html error. I have to give it one star because it’s broken and I can’t create a recipe without adding grain, etc. Please fix this ASAP.